Has unpredictable data growth resulted in management complexity and risk? HP StoreOnce Backup systems with StoreOnce Catalyst software provide a consistent, high-performance scale-out backup architecture that spans the entire enterprise and Federated Catalyst that can reduce management in large environments. You can reduce the amount of backup data you need to store by 95% and choose between powerful dedicated appliances for larger offices and data centers, and flexible virtual appliances for smaller and remote offices. Industry leading backup and restore speeds mean that you can meet shrinking backup windows and recovery SLAs. Plus, with HP StoreOnce as the industry’s only federated deduplication technology, you can dedupe anywhere and control the movement of dehydrated data across the enterprise using your backup application. Scale-out architecture allows you to pay as you grow. Choose capacity points available through virtual backup solutions or dedicated appliances that start small and allow you to add in virtual capacity, shelves or nodes. With a range of capacity points to suit all requirements from small remote offices to enterprise data centers with centralized monitoring through StoreOnce Enterprise Manager. For enterprise data centers the StoreOnce 6500 scales from 120 TB raw (72 TB usable) to 2240 TB raw (1728 TB usable). With StoreOnce Federated Catalyst whose benefit is that it reduces the number of stores, and management, of large environments. For mid-size data centers choose StoreOnce 4900, scale from 24 TB raw (15.5 TB usable) to 24 TB raw (31.5 TB usable) or StoreOnce 4900 or 4900 to scale from 24 TB raw (16 TB usable) to 192 TB raw (160 TB usable), or StoreOnce 4900 to scale from 60 TB raw (36 TB usable) to 560 TB raw (432 TB usable). For small and remote offices choose the StoreOnce VSA virtual appliance, now with support for KVM, it is licensed at 4 TB, 10 TB and 50 TB capacity points. Or the entry-level StoreOnce 4900 appliance for 8 TB raw (5.5 TB usable). 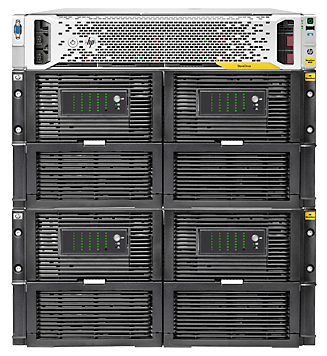 Federated Deduplication is available across the HP StoreOnce Backup portfolio – including dedicated appliances, virtual backup solutions, and on media servers and application servers with HP Data Protector, Symantec NetBackup and Backup Exec software through OST, Oracle RMAN and BridgeHead software. HP StoreOnce Federated Catalyst in a multi-node system allows Catalyst stores to span nodes simplifying backup management and optimizing available storage in large environments. Host interface 8 Gb Fibre Channel (4) and 10 GbE (2) and 1Gb Ethernet (4) Host interface type and number of ports per controller. Expert HP storage consultants and service professionals—sit down with you and your team to map your storage needs. Not only can we help you accelerate implementation and reduce deployment risk, but we can also help you realize the full value of your storage purchases as you transform storage for the New Style of IT. Navigate through the complexities of storage, backup, archive, disaster recovery, and Big Data with advisory, transformation, and integration consulting. Access expertise to support deployment, operations, relocation, sanitization, and disposal, plus improvement-focused education. System-level IT hardware and software support delivers flexible coverage window and response time for more choice and simplicity. Combined reactive and proactive services provide easy-to-purchase, cost-efficient system-level support coupled with personalized expert advice and products connected to HP to help prevent problems and reduce downtime. HP Proactive Care Advanced—builds and incorporates on Proactive Care and also gives customers personalized technical and operational advice from an assigned, local Account Support Manager for personalized technical collaboration, flexible access to specialist skills to help optimize business critical IT, and Enhanced Critical Incident Management to help so the business is not affected if there is a system or device outage. Get the support you need to deploy, operate, and evolve your data center environment to be hybrid-cloud ready with single-point-of-accountability for HP and others’ product. Get connected and get back to business—HP Storage Technology Services provide the path to get your HP Storage solutions and your business connected to HP. Once connected, our experts are able to scan your system and run health checks, then use that data to create personalized reports and recommendations for actions to take to prevent problems and downtime.